The KEF Q150 Bookshelf Speaker is the newest iteration of KEF award-winning Q Series. The Q150 features a new cabinet, sleek new finishes, and an improved 5.25" Uni-Q driver Array. The Q150 contains an enhanced Uni-Q Driver Array designed to smooth out treble frequencies, and reimagined crossovers to provide cleaner and more accurate bass. The front port has been moved to the back of the Q150 and internal architecture has been redesigned to reduce internal resonances to improve audio clarity. The Q150 is available in sleek matte Black and White vinyl finishes. Rank: #13 out of 124. Kef Q150 are a very popular option at the bottom of the price range. 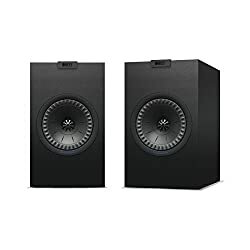 They're in the top 3 bestselling speakers and have dozens of popular alternatives in the same price range, such as HotNCold Bluetooth Speaker or Kef Q350 . Kef Q150 are $184.99 cheaper than the average speakers ($199.99).